ĐỒNG THÁP — The Đồng Tháp Province administration has ordered relevant agencies to take immediate measures to prevent landslides along the banks of the Tiền and Hậu rivers, which threaten thousands of lives. Due to the increasing flow rate, heavy river traffic, climate change, shrinking rivers, and illegal sand mining, landslides are occurring more often, Nguyễn Trung Ngay, director of the province Department of Natural Resources and Environment, said. Since Đồng Tháp is located in the upper reaches of the Mekong River where the water flows rapidly, landslides are inevitable. This year nine landslides have damaged three hectares of land and caused losses of over VNĐ10 billion (US$448,400), Ngay said. Recently some people living in Cao Lãnh City’s Ward 11 were evacuated due to high risk of landslides. According to Võ Thành Ngoan, deputy director of the province Department of Agriculture and Rural Development, many measures are needed to reduce landslides, including putting up warning boards and carrying out campaigns to raise people’s awareness of landslide prevention. 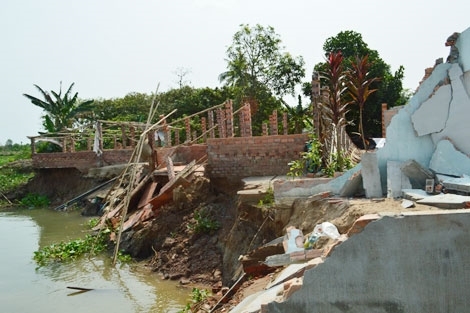 The province will continue to reinforce river embankments in Sa Đéc City and tackle erosion in Châu Thành, Lấp Vò and Hồng Ngự districts and others.